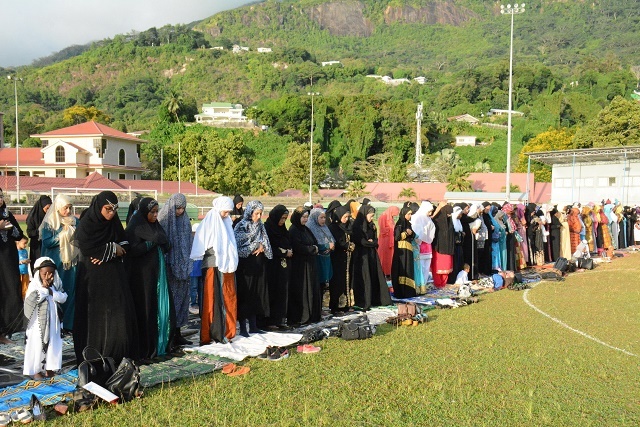 (Seychelles News Agency) - Muslims in Seychelles on Wednesday joined the global Islamic community in Eid-ul-Fitr celebrations marking the end of the fasting month of Ramadan. For the third consecutive year, various Islamic groups in the archipelago of 93,000 people came together at ‘Stad Popiler’ in the capital, Victoria. 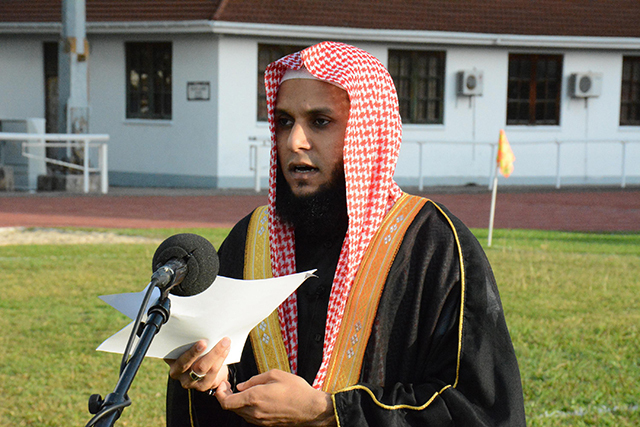 Imam Ahsan Haleem, a Maldivian who has been in Seychelles since January led Eid prayers, attended by Seychellois men, women and children as well as foreign workers following the Islamic faith. "Nowadays we are tossed by the winds into different directions, and I wanted to say to them that peace is a great blessing,” Haleem said to SNA. According to Haleem, he had noticed an increase in the number of Muslim believers at the mosque during the month of Ramadan, adding that he is hoping the trend will continue. "I asked them to continue to come and pray and not leave the mosque to the Imam only," said Haleem. 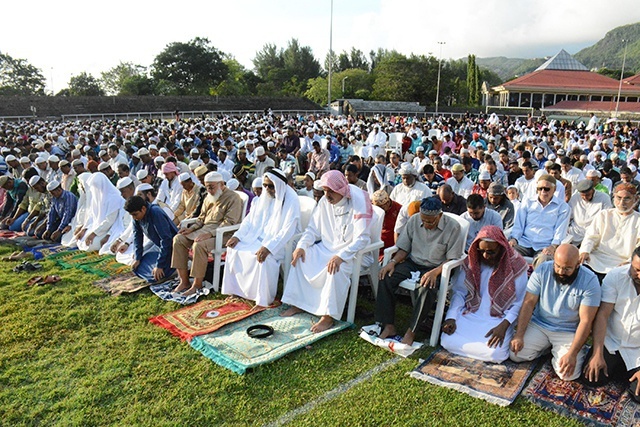 The Islamic Society of Seychelles had indicated that Ramadan in the 115-island archipelago in the western Indian Ocean ends Tuesday evening leading to Eid prayers at 7am on Wednesday. This year the month of Ramadan fell in June during which the island nation experiences a lowered temperature. "I made a lot of sacrifices. It was easier this year because of the southerly winds providing a cooler atmosphere," Harun Athanasius who attended the Eid prayers told SNA. Sister Houakma said to SNA that "after 30 days of making sacrifices, we now come together for a family feasting." After the morning prayers, many Muslims gathered at the Mosque in the capital Victoria to share a meal. 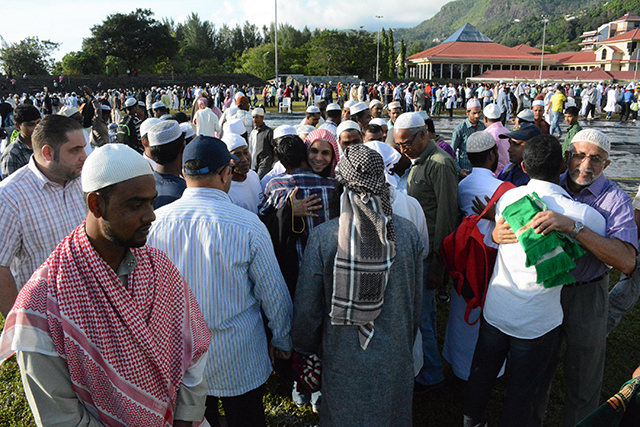 Eid-ul-Fitr is not a public holiday in Seychelles, but the law stipulates that it is at the discretion of the employers to release Muslim workers for the day. According to the national bureau of statistics, 76.2 percent of the Seychelles population is Roman Catholic, 6.1 percent Anglican, 2.4 percent Hindu, 1.6 percent Muslim, and 13.7 percent other faiths.